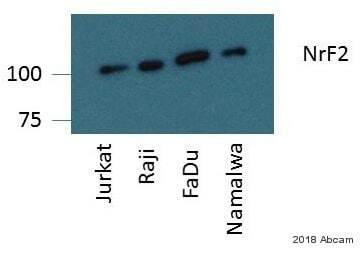 Rabbit recombinant monoclonal Nrf2 antibody [EP1808Y]. Validated in WB, IP, IHC, Flow Cyt, ChIP, ICC/IF and tested in Mouse, Human. Cited in 130 publication(s). Independently reviewed in 21 review(s). Synthetic peptide within Human Nrf2 aa 550 to the C-terminus (C terminal). The exact sequence is proprietary. WB: MG-132 treated HeLa whole cell lysate, Saos-2, THP-1 and HepG2 cell lysate. IHC-P: Human pancreatic carcinoma tissue. ICC/IF: HepG2 and HeLa cells. Flow Cyt: HeLa cells. ChIP: Chromatin from HepG2 cells. IP: SAOS-2 whole cell lysate. Mouse is not recommended for IHC (weak staining). Our Abpromise guarantee covers the use of ab62352 in the following tested applications. IHC-Fr 1/100. Fix with acetone. Note: antigen retrieval is recommended. WB 1/1000 - 1/5000. Predicted molecular weight: 68 kDa.Can be blocked with Nrf2 peptide (ab167152). Blocking and dilution buffer: 5% NFDM/TBST. Lanes 1 and 2: 15 seconds. Lanes 3 and 4: 3 minutes. Immunohistochemistry (Formalin/PFA-fixed paraffin-embedded sections) analysis of human pancreatic carcinoma tissue labelling Nrf2 with purified ab62352 at a dilution of 1/250. Heat mediated antigen retrieval was performed using Tris/EDTA buffer pH 9 (ab93684). Goat Anti-Rabbit IgG H&L (HRP) (ab97051) was used as the secondary antibody (1/500). Negative control using PBS instead of primary antibody. Counterstained with hematoxylin. Immunohistochemistry (Formalin/PFA-fixed paraffin-embedded sections) - Anti-Nrf2 antibody [EP1808Y] - C-terminal (ab62352)This image is courtesy of an abreview submitted by Rudolf Jung. Immunohistochemistry (Formalin/PFA-fixed paraffin-embedded sections) analysis of human kidney cancer tissue sections labeling Nrf2 with ab62352 at 1/100 dilution. The tissue was fixed with paraformaldehyde and a heat mediated antigen retrival step was performed with TRIS-EDTA Buffer pH 9.0. Staining with ab62352 at 1/100 was carried out in a dilution buffer with blocking for 30 minutes at 20°C. A undiluted goat anti-rabbit HRP conjugated secondary antibody was used. Immunocytochemistry/Immunofluorescence analysis of HepG2 cells labelling Nrf2 with purified ab62352 at 1/500. Cells were fixed with 4% paraformaldehyde and permeabilized with 0.1% Triton X-100. 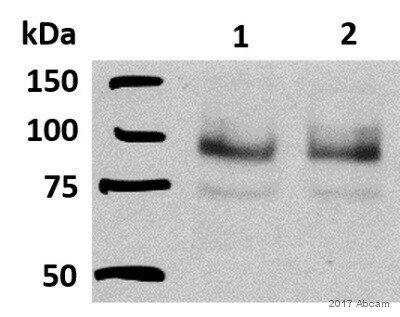 ab150077, an Alexa Fluor® 488-conjugated goat anti-rabbit IgG (1/500) was used as the secondary antibody. The cells were co-stained with ab195889, an Alexa Fluor® 594-conjugated mouse anti-alpha tubulin antibody (1/200). Nuclei counterstained with DAPI (blue). Secondary antibody only control: PBS was used instead of the primary antibody as the negative control. Immunocytochemistry/Immunofluorescence analysis of HeLa cells labelling Nrf2 with purified ab62352 at 1/500. Cells were fixed with 4% paraformaldehyde and permeabilized with 0.1% Triton X-100. 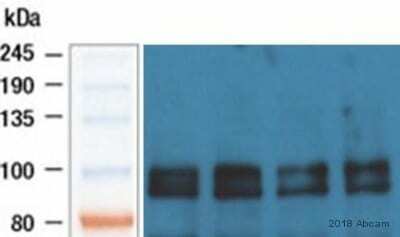 Goat Anti-Rabbit IgG H&L (Alexa Fluor® 488) (ab150077) secondary antibody (1/1000) was used as the secondary antibody. Cells were counterstained with ab195889, anti-alpha Tubulin antibody [DM1A] - Microtubule Marker (Alexa Fluor® 594). DAPI was used to stain the nuclei blue. Chromatin was prepared from HepG2 cells according to the Abcam X-ChIP protocol. Cells were fixed with 1% formaldehyde for 10 minutes. The ChIP was performed with 25µg of chromatin, 2µg of ab62352 (blue), and 20µl of A/G sepharose bead slurry (10µl of sepharose A beads + 10µl of sepharose G beads). 2μg of rabbit normal IgG was added to the beads control (yellow). The immunoprecipitated DNA was quantified by real time PCR (Sybr green approach). 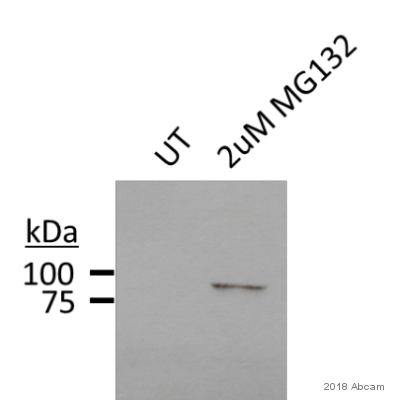 ab62352 (purified) at 1/30 immunoprecipitating Nrf2 in SAOS-2 whole cell lysate. Lane 2 (+): ab62352 + SAOS-2 whole cell lysate. Lane 3 (-): Rabbit monoclonal IgG (ab172730) instead of ab62352 in SAOS-2 whole cell lysate. 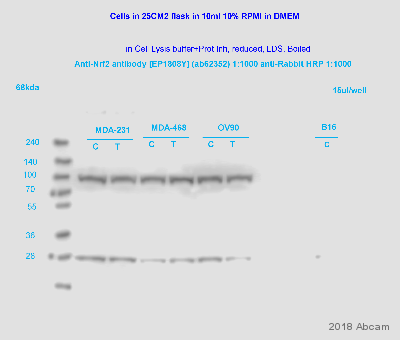 For western blotting, ab62352 was used at a dilution of 1/500 and ab131366 VeriBlot for IP (HRP) was used as the secondary antibody (1/1000). Flow Cytometry analysis of HeLa cells labelling Nrf2 with purified ab62352 at a dilution of 1/60 (red). Cells were fixed with 4% paraformaldehyde. Goat Anti-Rabbit IgG H&L (Alexa Fluor® 488) (ab150077) secondary antibody (1/2000) was used as the secondary antibody. Black - Isotype control, rabbit monoclonal IgG (ab172730). Blue - Unlabelled control, cells without incubation with primary and secondary antibodies. Flow Cytometry analysis of HeLa (human cervix adenocarcinoma) cells labelling Nrf2 with ab62352 at 1/40 (red). Cells were fixed with 4% paraformaldehyde and permeabilised with 90% methanol. An Alexa Fluor® 488-conjugated goat anti-rabbit IgG (1/2000) was used as the secondary antibody. Black - Isotype control, rabbit monoclonal IgG. Blue - Unlabelled control, cells without incubation with primary and secondary antibodies. Publishing research using ab62352? Please let us know so that we can cite the reference in this datasheet.